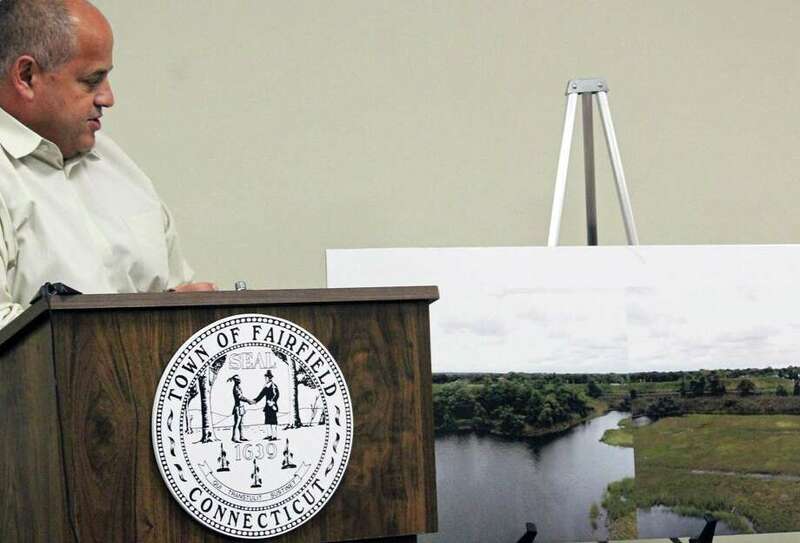 FAIRFIELD — While the cost to remediate a contaminated area at the town’s fill pile, and construct a landscaped berm totaled almost $800,000, Public Works Director Joseph Michelangelo said the work also saved the town money. In fact, Michelangelo told the Board of Selectmen Wednesday, building the berm not only addressed neighbor complaints, but it also used about 40,000 cubic yards from the fill pile. The value of the material that was used, he said, is about $800,000, based on a figure of $20 per cubic yard. That use reduced the estimated 100,000 cubic yards that made up the pile to 60,000 cubic yards. Of the material remaining, Michelangelo said, 16,500 cubic yards will be used as part of the town’s hardening project around the wastewater treatment plant, to prevent it from being flooded. He said that material is valued at $681,900. Michelangelo said the remaining material may still prove valuable for use in other town projects. Selectman Edward Bateson wanted to know now that the pile, and neighbors’ complaints, have been addressed, what the plan is going forward to deal with construction and road spoils generated by the town. “Regarding the aggregate pile, the big chunks (of material) we don’t have anything to pulverize the material,” Michelangelo said. Once the accumulation of the larger material gets big enough, he said, the town would either bring in a contractor for a limited time period to break up the material, or the department will rent the needed equipment. “It would cost about $50 a ton to send out,” Michelangelo said. First Selectman Mike Tetreau said they’ve identified some other town projects where the remaining material can be used and said they’ve gotten some “soft” interest from other out of town parties that might be able to use some of it. He also said the spoils from town projects are being handled in separate areas of the Public Works yard, with separate containers for concrete, asphalt or street sweepings. No material, according to Michelangelo, has gone into the main pile since December of 2016, when it was shut down. Michelangelo said the department is paying about $20,000 a year now to cart away some of those spoils. A court case again Julian Enterprises is still proceeding. Julian had a three-year contract with the town, the goal of which was to reduce the size of the fill pile. Instead, the town claims the opposite occurred, and at one point, some material contaminated with low amounts of PCBs and lead, was dumped at the pile. Julian has countersued the town for defamation. The town spent $396,260 on soil testing and remediation, which it is seeking to recover through the lawsuit.